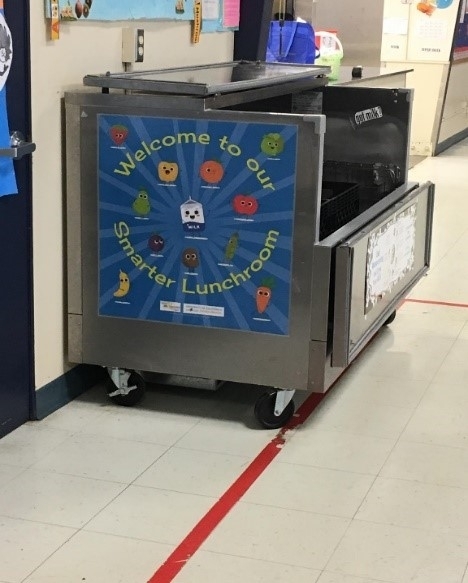 The UC CalFresh Nutrition Education Program and Fresno Unified School District Food Services Department began implementation of the Smarter Lunchrooms Movement (SLM) in 9 elementary schools starting during the 2017-2018 school year. SLM is dedicated to providing schools with the knowledge, motivation, and resources needed to build a lunchroom environment that encourages healthy food choices as the easy choice. Through shared efforts, over 6,000 students were impacted. Below are summaries of each school that participated in SLM during the 2017-2018 school year. Ayer's student council, led by 6th-grade teacher Mr. Villanueva, headed the SLM project. The council's main priority was coming up with creative names for lunch menu items. 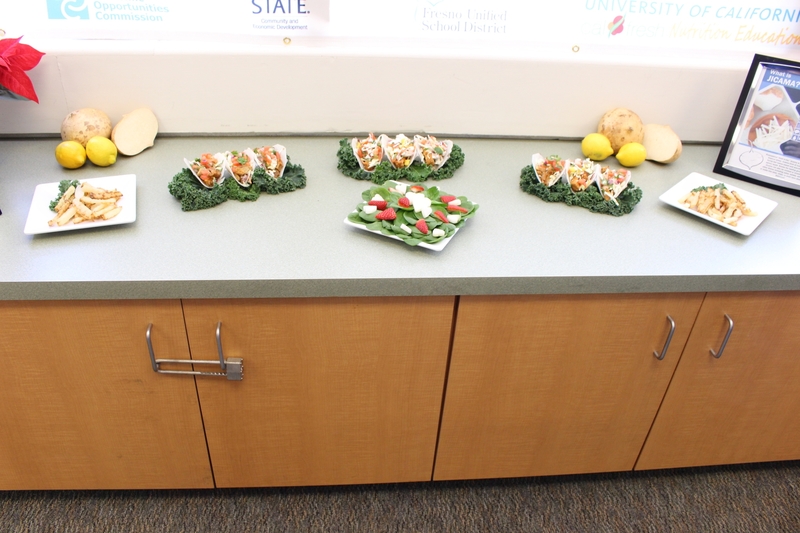 Some of their ideas included fiesta salad, fresh tropical tangy fruit, and big and bold broccoli. To give more students an opportunity to participate in SLM implementation, UC CalFresh held an SLM booth at the spring carnival, where students could create Fruit and Veggie-of-the-Day cards, sign thank you cards for School Lunch Hero Day, and draw artwork for the cafeteria. Different grade levels were also given the opportunity to contribute original artwork to the lunchroom cafeteria. 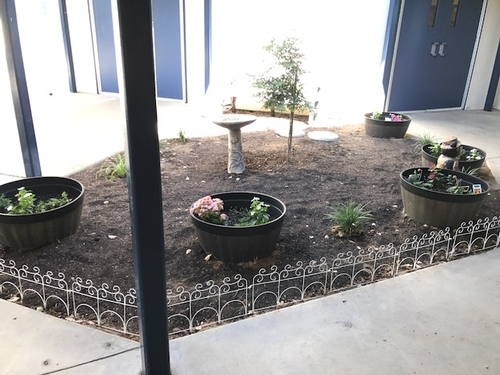 UC CalFresh worked with the principal, Melissa Jones, and cafeteria manager, Gracie Garcia, to implement changes to the cafeteria space. 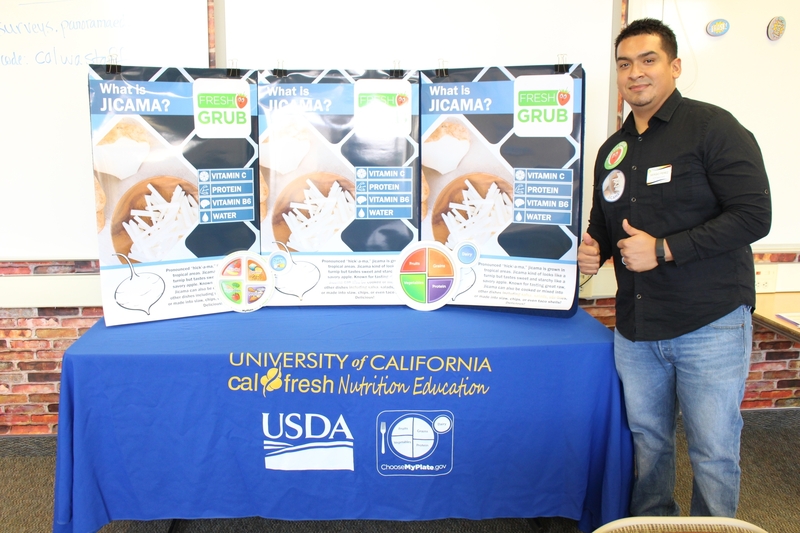 UC CalFresh coordinator Tacu Vang helped provide the technical assistance needed to guide staff to create a healthier cafeteria environment for the students by providing signs and decals promoting healthy options. He also helped find resources for the school to hang a MyPlate banner that was unused. Bakman showed a six-point improvement by the end of the year, putting the school in the silver SLM category. This was a big improvement and reinforced the commitment the school made to creating a healthier environment for students. Birney Elementary had a successful second year of SLM implementation. The lunchroom environment was further enhanced with the addition of new colorful nutrition posters and a nutrition corner that were changed bi-monthly. Students mentioned they looked forward to the nutrition corners and seeing their artwork displayed. 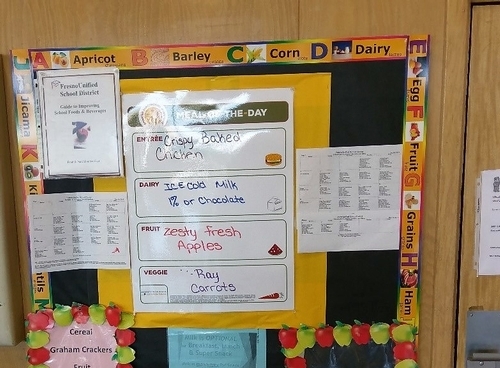 Birney cafeteria staff regularly utilized the menu board to highlight both breakfast and lunch items. At the end of the year, the final scorecard showed a six-point improvement to the lunchroom through the use of creative and descriptive names on menu items. UC CalFresh hopes to increase student involvement by including suggestions of creative and descriptive names, renaming the lunchroom, providing feedback, and continuing to use student artwork. This year UC CalFresh Coordinator, Nora Lopez, had the opportunity to work with Irma Rodriguez, Homan's Elementary cafeteria manager. In the first visit to the cafeteria back UC CalFresh staff was surprised Irma was still using a My Pyramid poster; she loved the pictures and bright colors the poster provided for the students. UC CalFresh let her know MyPlate was the most current guide to eating healthy. A Nutrition Corner was placed in the teachers' lounge using MyPlate to get her on board. 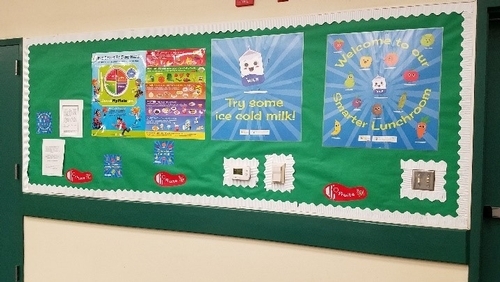 After teaching nutrition lessons, adding a nutrition corner, and the Smarter Lunchroom concept was introduced, Irma began incorporating MyPlate and removed the My Pyramid poster. Irma welcomed SLM with open arms. Next school year's goals include working with the student club and the after-school program to create nutrition posters and creative names for the school menu. Irma is hard working, paying attention to students' comments and needs and is a valued contributor to SLM. 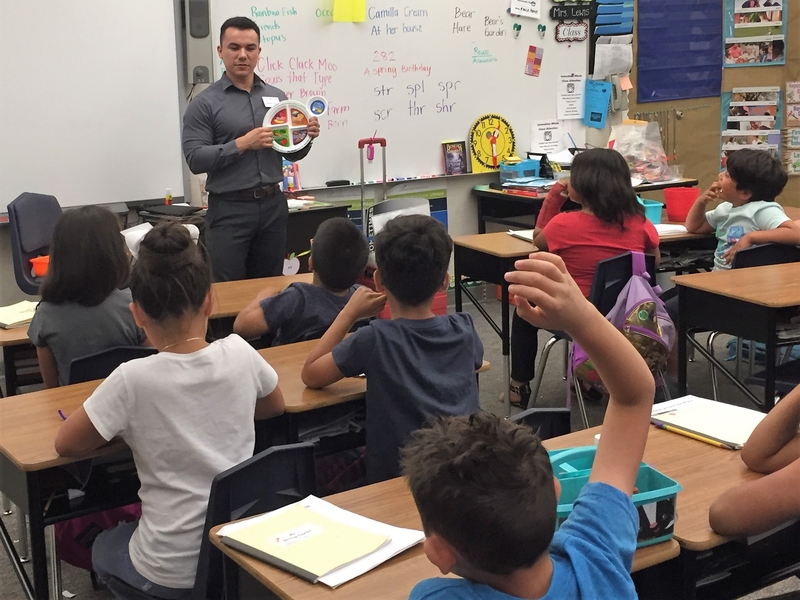 With the students' exposure to nutrition education, SLM was a great way to reinforce the message of making healthier choices. Emily Leung, cafeteria manager, was very supportive of having the posters and stickers in clear visual areas, as well as making sure white milk was more visible than chocolate milk. Teachers and staff encouraged students to eat or try their fruits and vegetables during lunch time. UC Calfresh will continue to connect with Emily on improving their scorecard next year. UC Calfresh plans to connect with Lowell's student council group to build a health coalition to increase student involvement in the lunchroom. Overall, Lowell scored a total of 31 out of 60, earning them in a silver award. 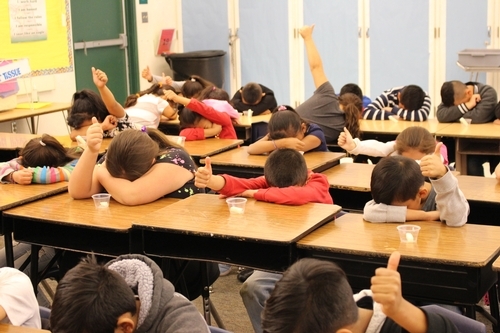 Headed by the lunchroom manager Sherie Jackson, McCardle's SLM had a successful first year. Nutrition and physical activity reinforcement posters and decals were posted in the cafeteria to liven up the environment and create healthy food “advertisements”. 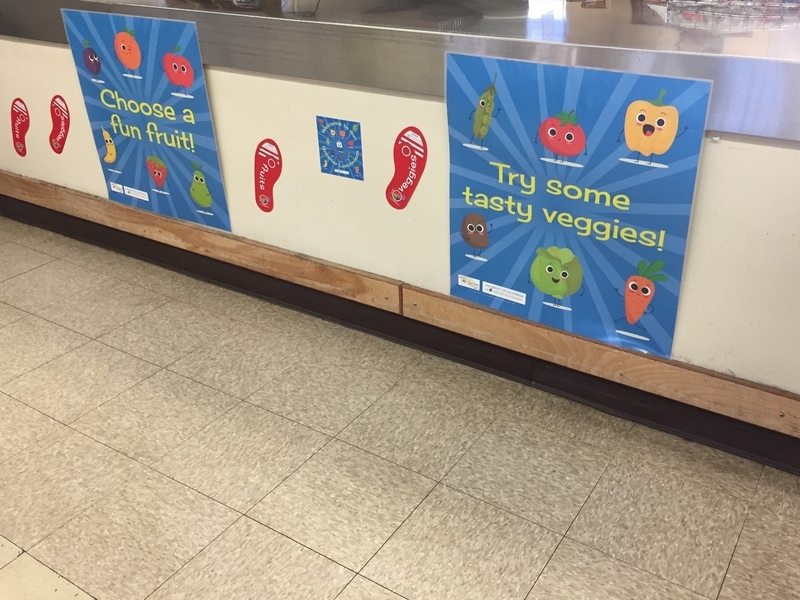 These posters, in conjunction with a MyPlate Nutrition Corner, sought to encourage students to consume more fruits and vegetables, and participate in physical activity. McCardle saw a three-point improvement through their interventions over the year. 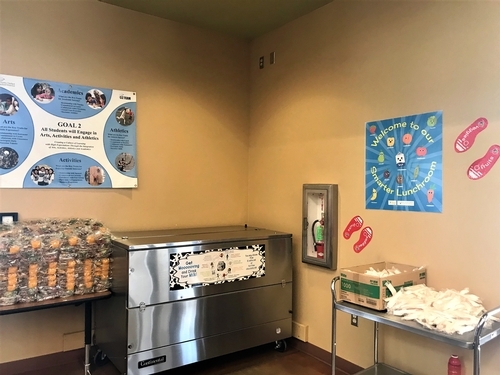 Improvements included placing a clear traffic pattern with the use of decals and footprints, identifying 1% or non-fat white milk as the featured milk, and displaying attractive and healthful posters in the cafeteria and service area. Next year McCardle will incorporate student leadership and school spirit to create nutrition and physical activity art contests that will be displayed in the cafeteria. UC CalFresh worked with the Cafeteria Manager to implement healthy food messaging by putting up a menu board displaying the meal-of-the-day, and fruit/vegetable-of-the-day cards both using creative names. They also increased the visibility of white milk in the coolers and included healthier food messaging to make the dining experience fun and enjoyable; improving students chances of consuming healthier meals. Student artwork was also placed in the cafeteria to make the students a part of the lunchroom experience. Students are excited to see their artwork in the lunchroom and the relationships between students and cafeteria staff have improved due to encouragement from school students and staff. To finish off the year, UC CalFresh partnered with the teachers to create thank you cards for the lunchroom staff from students to show their appreciation for the hard work done all year long. The students of the Rowell Elementary Spirit Club began the process of revamping their lunchroom through the SLM. 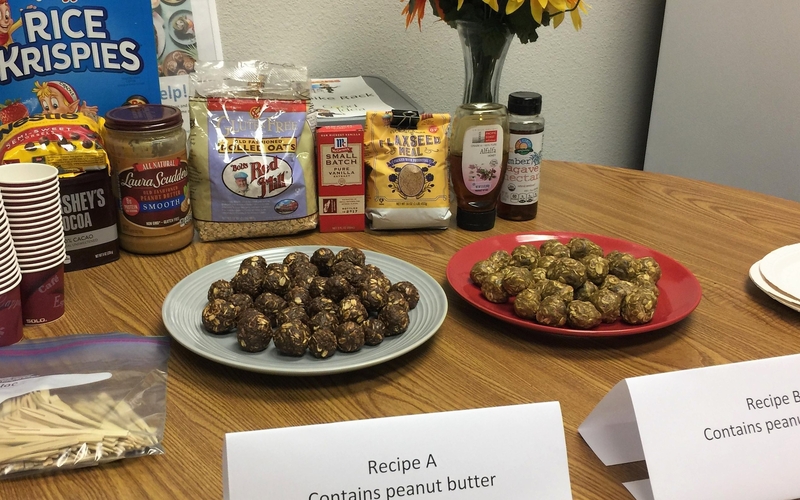 Under the support and guidance of their school's Nutrition Educator, Ashley Abrahamson, and teacher Erica Alarcon the students created fun and creative names for lunch menu items. 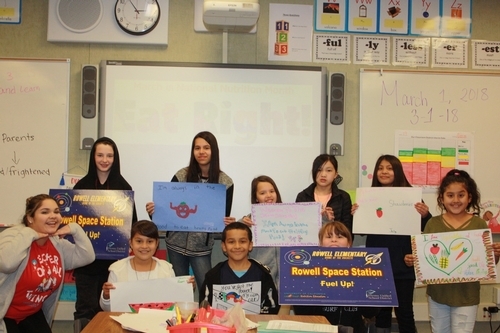 Since the Rowell mascot is the Rockets, the students unanimously agreed to maintain a space theme for both food items and their newly chosen cafeteria name. The spirit club voted on a new cafeteria sign that is now posted on the Space Station entry, filled the lunchroom with artwork created by their peers at a poster party, and hosted a grand opening celebration where Spirit Club students welcomed their friends to the Space Station as they entered for lunch. 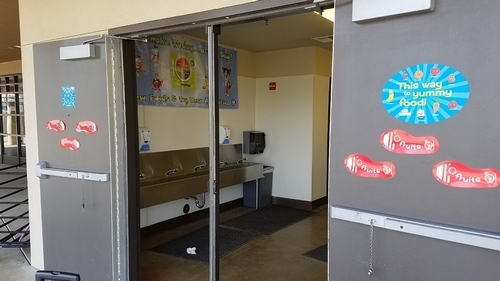 Smarter Lunchrooms at Vang Pao has been an essential addition to the school's healthy environment. 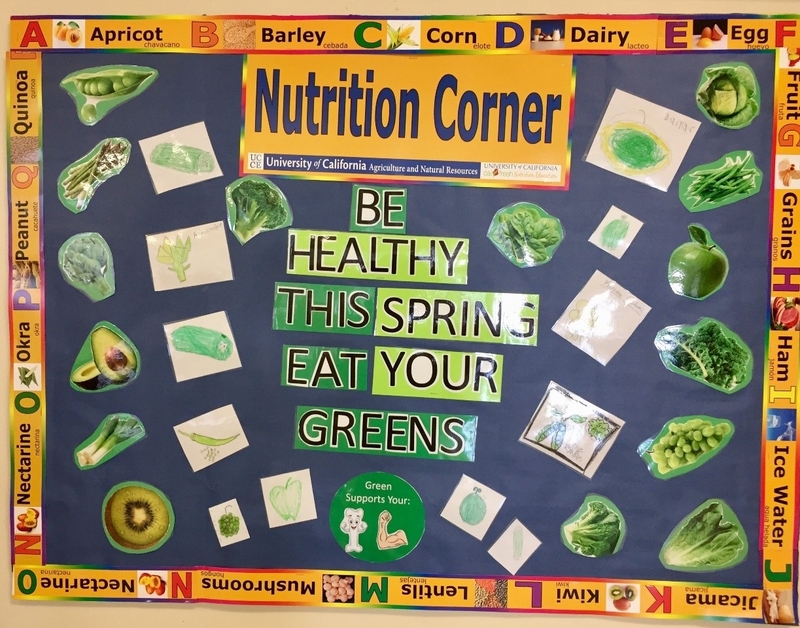 Nutrition educator, Coraima Linares, led the improvements and successes at Vang Pao which included: adding healthy posters throughout the cafeteria along with updating the Nutrition Corner and keeping it well maintained. Another success noted was how the school made white milk the first choice and at least a third of the cooler, which earned them an extra point on their final scorecard. The goals for next year are to include students to help with maintenance and creativity of the cafeteria, incorporate the cafeteria manager as a role model to guide improvements, add creative descriptions to lunch menu items and rename the lunchroom. Coraima also plans to focus on identifying a champion teacher or student in the upcoming school year to support SLM. 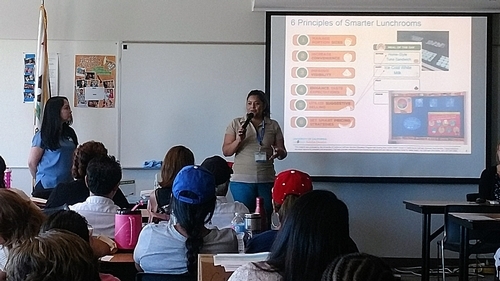 If you would like a Smarter Lunchrooms technical assisting professional to visit your Fresno Unified elementary school please contact project coordinator Evelyn Morales at eamorales@ucanr.edu. I cannot think of a better way to end my internship experience than with this unique rotation at UC Calfresh. Though I have a rich background in community service, I have never been exposed to such an active group of people working together to deliver nutrition education to such a wide range of population groups, all while having tons of fun in the process. Although my two weeks here flew by there was never a dull moment. From the start, I had the opportunity to observe and assist at Jobs 2000, a program by Proteus Inc, a premier provider of training, education, and community services within the agriculturally rich Central San Joaquin Valley. I emphasized with this group of individuals. Reason being, much like most the people in the class I also grew up on the "wrong side of the tracks" per say. I am familiar with the hardships of being a teen dad while trying to find meaningful employment to support my family. Fortunately, I had the opportunity to return the following week and lead a lesson on smart shopping and reading nutrition labels. Overall the class was a lot of fun, and I believe I helped make an impact. Reflecting back, its safe to say each day was both insightful and exciting. For instance my second day I helped assist in lessons and conducted my first food demo at Rescue the Children, a protective, secure environment that provides long-term services to at-risk, abused, homeless, previously incarcerated women, or women with children. These groups of women were very receptive to learning about nutrition fundamentals and basic gardening skills. If you ever felt that mushy heartfelt feeling, well, this was one of those days for me. I had an excellent and fun time with these women. My heart truly goes out to these ladies, and I sincerely wish them the best. Throughout my internship, I've heard interns talk about their great experience teaching MyPlate in elementary schools. Full disclosure, when I got word that I will be assisting in lessons and class activities at Slater Elementary School, I was beyond nervous. In my mind teaching elementary students meant being animated and the ability to talk in a playful voice. Being that I was in the military for eight years as a combat infantryman and having a deep monotone voice, I am the total opposite of that. I was dreading being out of my comfort zone and yet, it ended up being one of my favorite experiences. Reading and teaching some yoga moves to the first graders was the cutest thing ever. During this rotation, each intern is to develop a nutrition corner presentation board of their choosing. Nutrition Corners are centered on MyPlate and are designed to enhance school environments by providing indirect nutrition education that is appealing to students, parents, and educators. 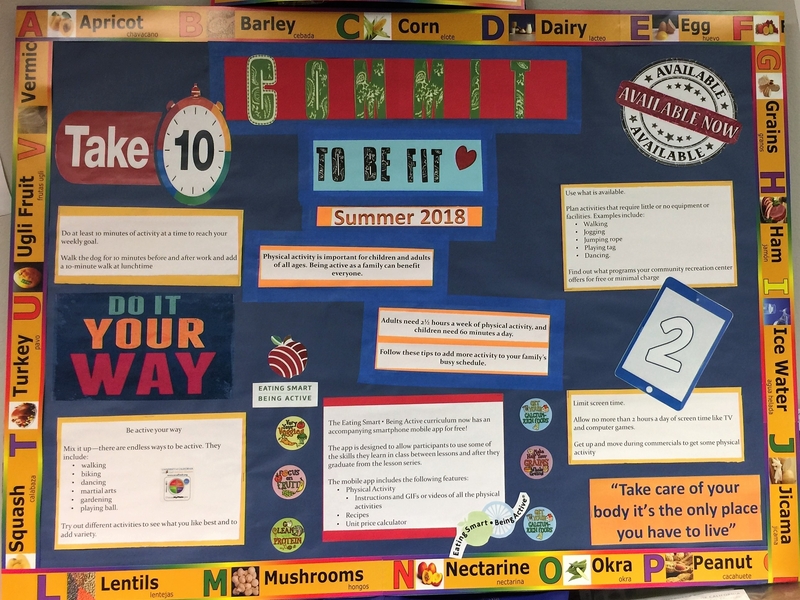 I am incredibly passionate about implementing physical activity in everyday life, so I decided to base my Nutrition Corner topic on physical activity and went with the theme "Commit to Be Fit." Keeping in mind that less is more and being careful to not clutter the poster board I decided to implement five simple tips on incorporating physical activity into any lifestyle. These include taking at least 10 minutes of activity at a time to reach a weekly goal, being active in one's own way, using what is available to plan activities that require little or no equipment or facilities, and limiting screen time to no more than 2 hours a day. Interestingly, I was later informed that my Nutrition Corner will be located at Jobs 2000. Knowing they use The Eating Smart • Being Active curriculum, I decided to implement a section of the accompanying smartphone free mobile app. The app is designed to allow participants to use some of the skills they learn in class between lessons and after they graduate from the lesson series. On my final day, I participated in the moringa project. Moringa is a unique tree that is drought resistant that does not require any special soil and is remarkably nutritious. Parts of it are often eaten in underdeveloped countries as a nutritional supplement because it's high in protein, vitamins A, and C, iron, calcium, and zinc. My task was to create a recipe of my choosing and formulate a different version of the method by adding or removing ingredients, making healthier versions, or making it taste better. The goal is to create a unique and delicious moringa recipe. I decided to use moringa powder in energy bites. Energy bites are one of the latest on-the-go health trends because they are super easy to make, and like smoothies, they're an opportunity to get creative with nutritious foods. I figure this would be a great way to promote the use of moringa powder in health trending recipes. I want to thank the UC Calfresh staff for their time and effort in providing this memorable learning experience. Thank you for your time and allowing me the opportunity to expand my skills as an active member of our community. But most importantly for reinforcing the importance of community involvement, building relationships, and provide a service to those who need it most. 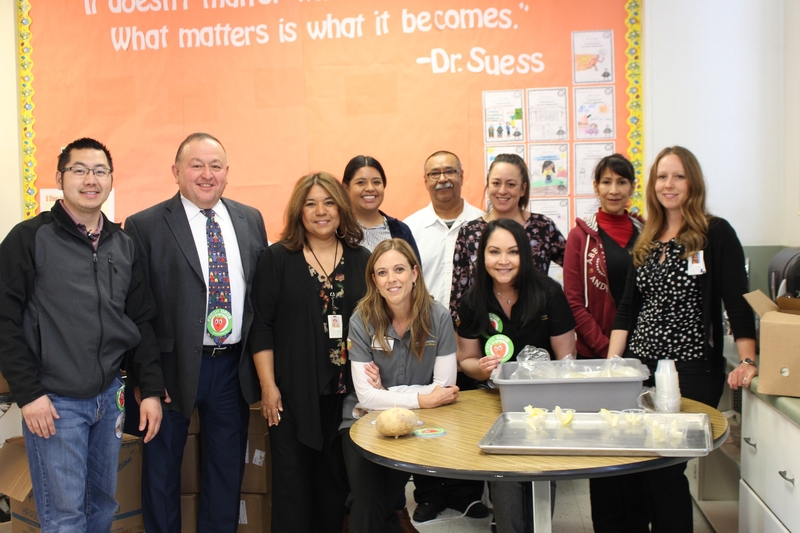 UC Calfresh joined Fresno Economic Opportunities Commission (EOC) to promote a new vegetable to the Calwa Elementary students during the Fresh Grub event on February 28th. 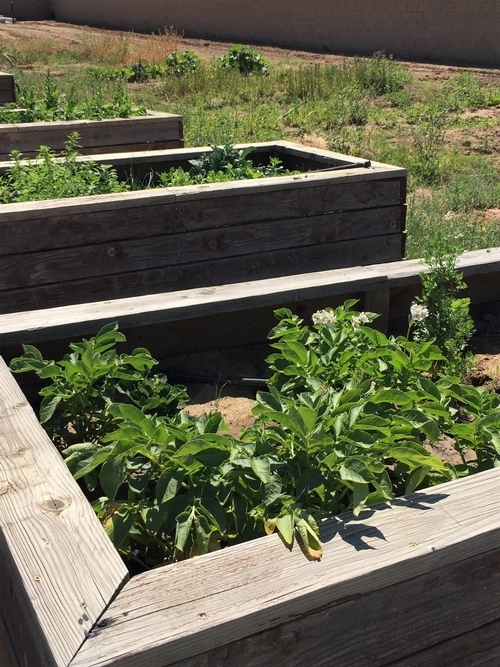 Fresh Grub links with school cafeterias to provide students with locally grown produce. 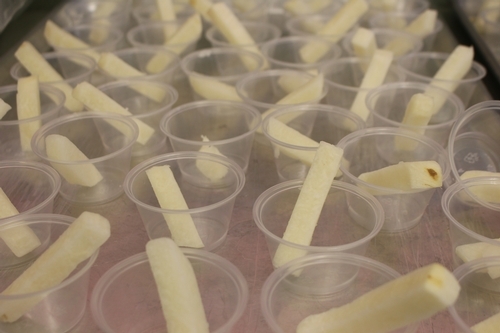 At this event, the new vegetable that was introduced to children, teachers, and parents was jicama. 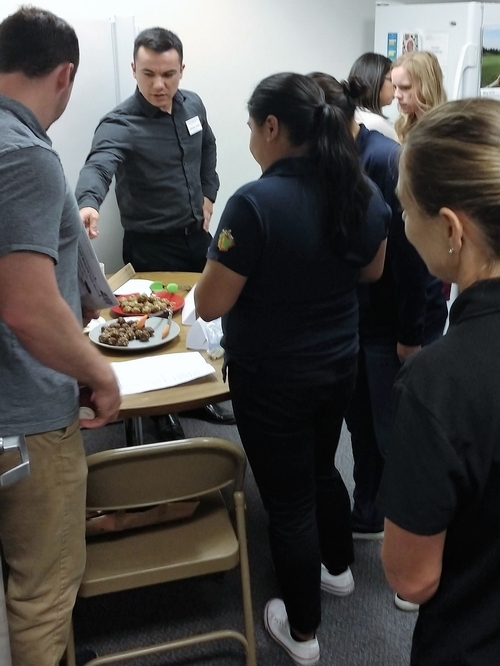 The event was hosted by Fresno EOC, and UC Calfresh was there to support in providing direct education and facilitating a jicama taste test with the students. Others that played a big part in developing the event include Fresno State Community and Economic Development, Fresno Unified School District, and Fresno County Farm Bureau. ABC30 News was also present to film the event. Calwa's UC Calfresh Nutrition Program Educator, Sergio, is ready to present educational information on jicama. UC Calfresh Nutrition Program Educator, Mishelle, shows a picture on how jicama originally looks like before being cut. The grade levels that participated in the jicama taste testing were 3rd, 5th, and 6th grade students. There were two types of tastings the students were exposed to. The first tasting was jicama by itself, and the second was jicama with lemon. 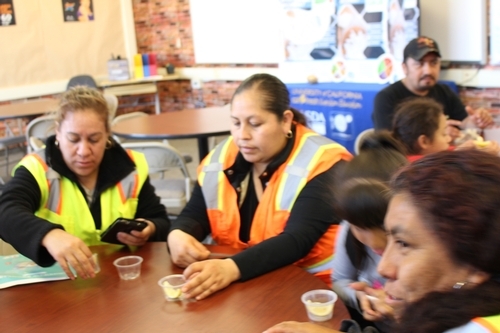 The UC Calfresh team recorded the student's response of ever trying jicama, if they tried it at the time, were they willing to eat it again, and if they were willing to ask for it at home. Afterwards, ABC30 News asked the students' feedback and opinion on the tasting. 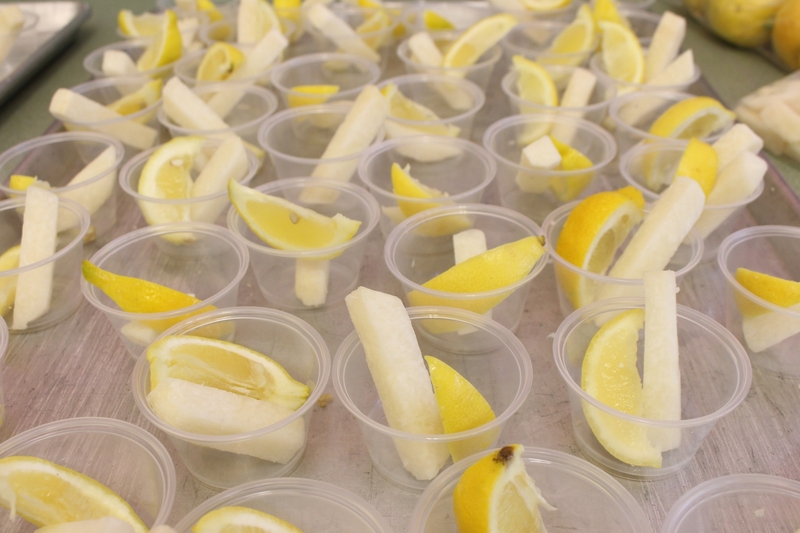 At the end of the students taste test, we had teachers and parents taste both tastings and give us their response on whether they would serve the plain jicama or jicama with lemon at home. Students were excited to try new foods. For those who have tried it, they were surprised at seeing other ways jicama can be eaten. Different ways jicama was represented included eating it in a form of French fries, salad, or a taco shell. 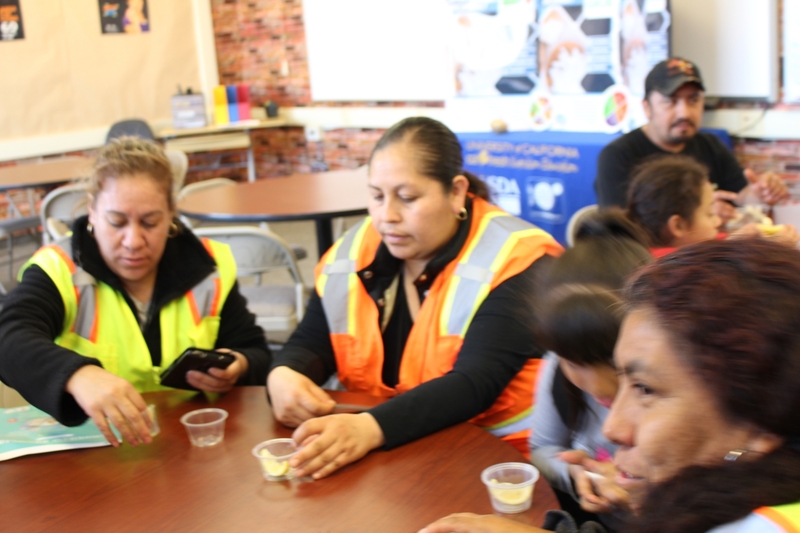 Parents and staff from Calwa Elementary tasting the jicama with their children. Group photo with the staff members of Fresno Economic Opportunities Commission, Fresno Unified School District, and UC Calfresh. The Fresh Grub was a successful event. There were about 200 students who participated, as well as parents and teachers who did the jicama taste test at the end. Fresno's EOC and UC Calfresh did a great job coordinating the event. 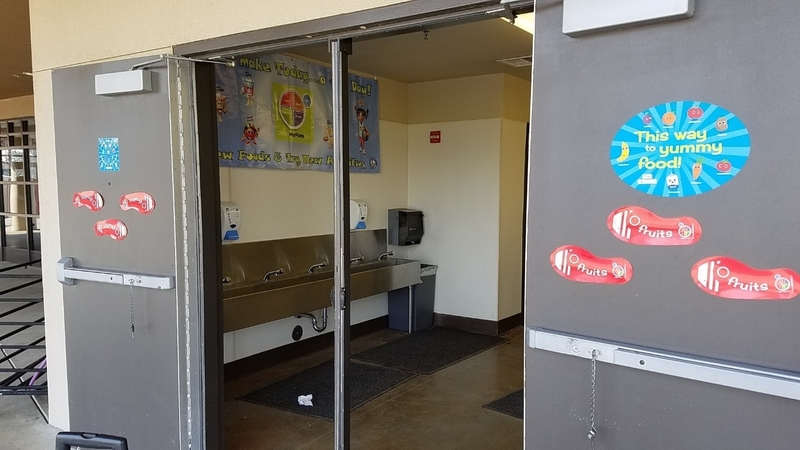 UC Calfresh will continue to push healthy eating to the students in the cafeteria, as this can help make healthier decisions and explore different foods. Ayer Elementary's entrance was upgraded in August with an herb and flower garden, just in time for the new school year. 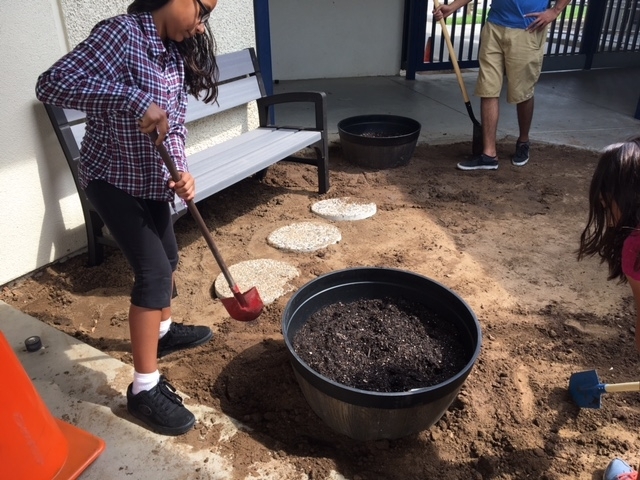 Students and parents joined the UC CalFresh garden team in beautifying the front of the school at the request of Principal Rocha-Salazar. Take a look at the photos below to see the great work UC CalFresh's garden team and some wonderful parents and students did. These bright flowers are sure to bring new life to Ayer's entrance! All finished! The new garden area includes a bird bath, several barrel planters, and a bench so the Ayer community can relax and enjoy the garden. 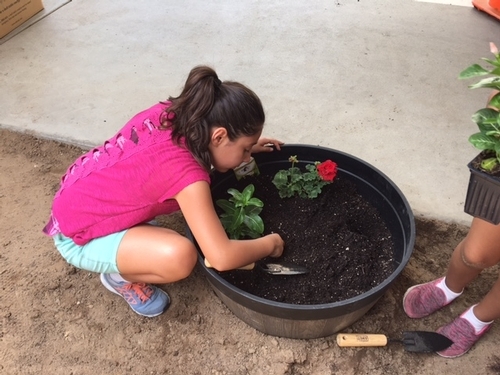 Herbs were also planted and parents are looking forward to harvesting them to add new flavors to their favorite dishes! Principal Rocha-Salazar hopes that this new space provides a welcoming environment for parents and students to enjoy. 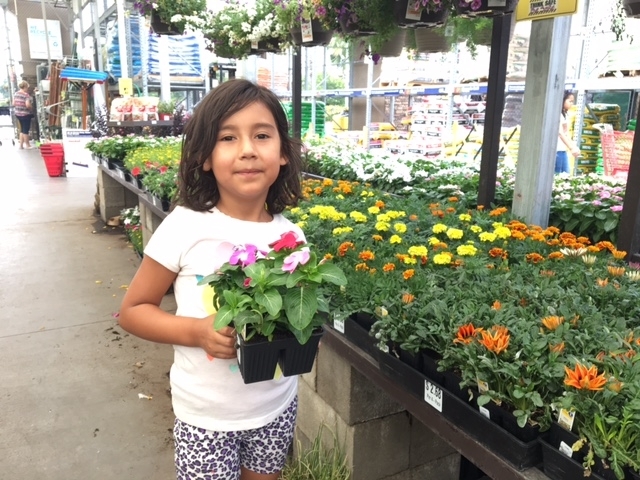 We look forward to seeing the garden for years to come! New School Year, New Projects, Same Great Partnership! UC CalFresh Nutrition Education Program and Fresno Unified Nutrition Center are partnering up again this year to create healthier environments for students. This year's projects were presented to FUSD Kitchen Managers on July 27th during their beginning of the year training. 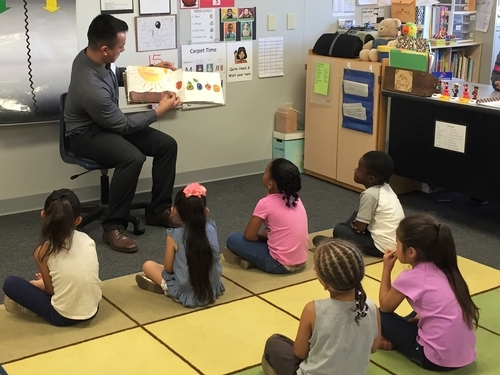 Fresno Unified will be rolling out a new project this year that will impact each of its elementary schools: The OrganWise Guys. Nath Say, UC CalFresh Program Supervisor, presented information on The Organ Wise Guys to Fresno Unified staff, detailing key messages and resources schools can use. 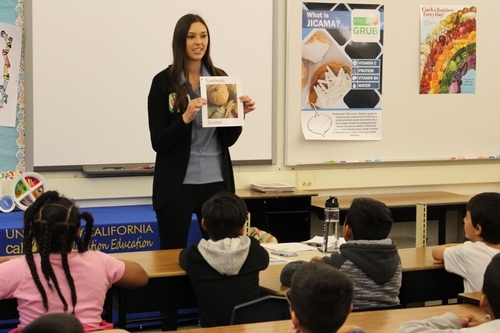 UC CalFresh educators will be encouraging teachers who want to further their students' nutrition education to check out their school's OrganWise Guys Doll Kit. 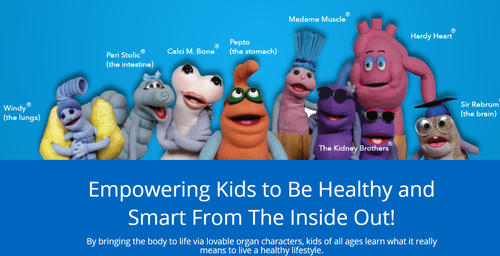 Check out our other OrganWise Guys blog post! This year, UC CalFresh and Fresno Unified will be working together to implement the Smarter Lunchrooms Movement in 22 elementary schools. UC CalFresh's main focus will be to assist with new visuals, such as posters and menu boards, which will enhance the lunchroom environment and encourage students to choose and consume healthier foods. 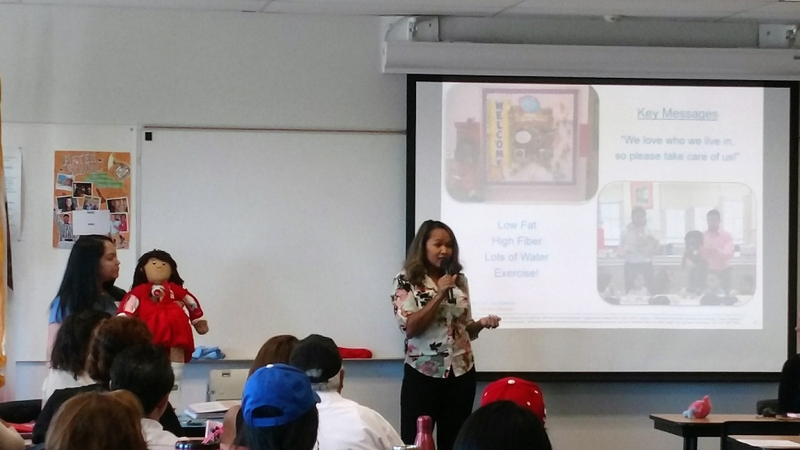 UC CalFresh Educators will also serve as resources for schools who want to build a healthier lunchroom and school environment. 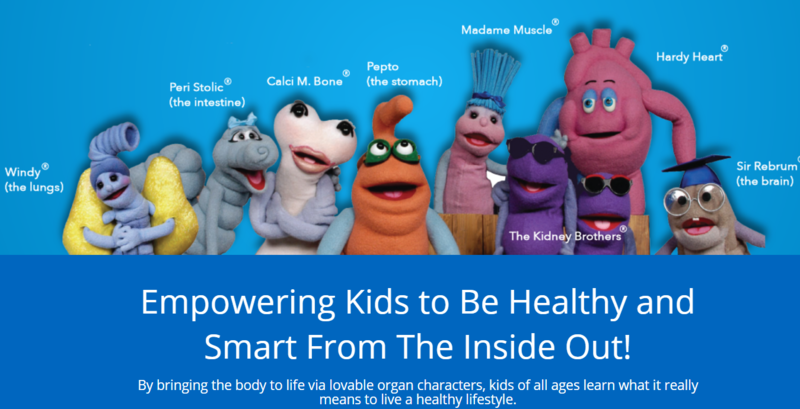 Check out our other Smarter Lunchrooms Movement blog posts! Stay tuned to see our progress throughout the year!